You’ve probably seen them, they’re in a number of shops; multiple locales rendered in wood, behind glass. Rusty and I have always looked at them but never bought them. We didn’t have wall space, and couldn’t agree on which one to buy anyway. There’s one of Puget Sound, and of the San Juan Islands, and of the Salish Sea, and … well, how do you choose? They have lots of them, from all over the States, even the Caribbean. First, a clarification. I thought of these as ‘relief’ maps, but they’re not – they’re bathymetric, the fundamental difference being that the former is the measure in elevation or slope on land, and the latter is measurement of that difference in water. And it’s a fun word to toss around in conversation, just to see who else knows what it means! The maps are beautiful as well as useful. Now that we’ve moved to Poulsbo, we DO have wall space, so since choosing was too hard, we bought all three of the maps mentioned above. 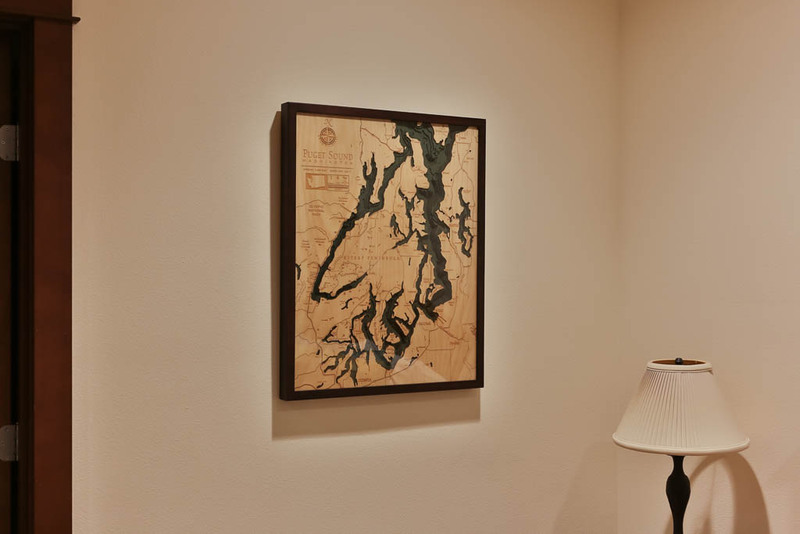 We put the Puget Sound chart in our guest room, since most of our visitors aren’t familiar with the Kitsap Peninsula and it provides a wonderful perspective. 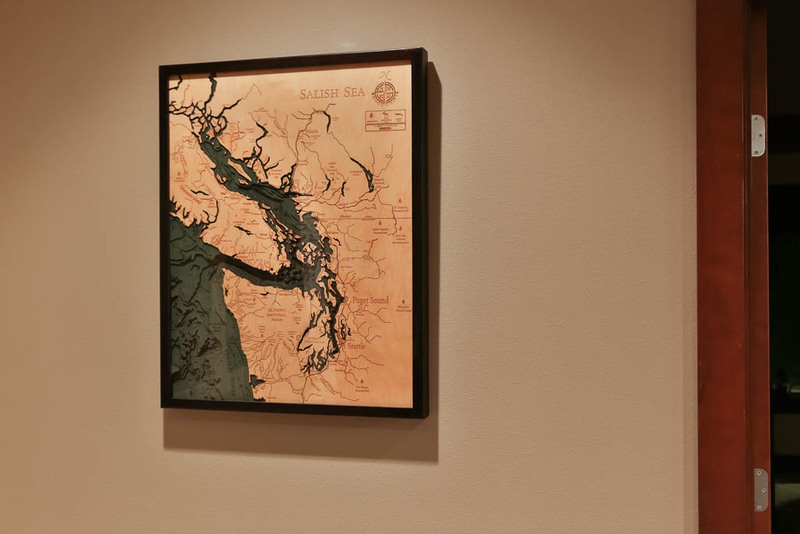 The Salish Sea and San Juan Island charts are in the den, with the Salish Sea showing the whole region (including the Gulf Islands, which we love). Now if they only made one of Desolation Sound….. 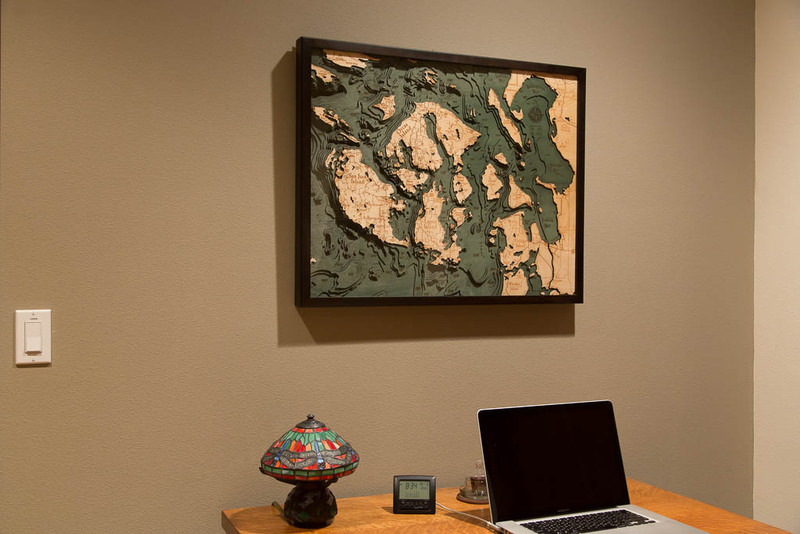 Anyway, if you haven’t seen these before, they’re worth a look (take a peek at http://www.3dwoodmaps.com). For us, they help commemorate so many good times on the water, and while true nautical charts (or even maps) could do the same, these are just plain more fun. And isn’t fun what it’s all about? This entry was posted in Interesting and tagged Archimedes, boating, Grand Banks, Pacific Northwest, Puget Sound, Salish Sea, San Juan Islands, Seattle, Trawler by Kim. Bookmark the permalink.